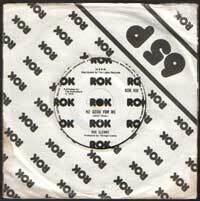 The ROK label is quite famous to have released some great one off 7inches. All accompanied with the incredible top notch looking ROK paper bag. Guess it was a matter of money. Another call for Low Down Steve here since searching Google didn’t gave me much information except that some japanese collectors are looking for this and that it was on “Powerpearls Vol. 1”. It’s a split with “Hazard” with a track that is just bad. But with a needle you can easily erase it. What a great band! Thanks for putting this up! Most of those Rok bands were a total mystery, my favourite is X-Films “After My Blood” followed closely by “You” from Just Frank. The Clerks did another 7″ much later, ’84 I think. The Clerks were from Birmingham, by the look of it. Great record! Just Frank, by the way, had that bloke Ringo from The Strangeways (“Wasting Time” etc) in the band. My favourite ROK track is the Urban Disturbance! I’ll pay 65p for this, any day of the week! I seem to remember that albums were always around the 5 pounds or 5.99 mark from 1976, right up to the end of the eighties, yet singles crawled up from the 50p mark to about 1.75 in the same time span – or is my memory playing tricks on me? Dammit Blendheim Shots, now that’s quite an interesting question! Could it be that while everything else got cheap and cheaper, records became more and more expensive? Phew, guess have to think about this for a while. Erich, yes I know, taking the piss….. in a nut shell, albums remained at a more-or-less static price for over a decade, whilst single prices more than tripled. I think this is because singles never really made anyone any money – they are pretty much just a promotional tool for capitalist types – the albums, live shows and assorted merchandise are the real cash cows I believe. Erich, I find that Punk singles (late 70’s early 80’s) interesting, along with their covers, which in this case has a price boldly printed upon it. Obviously you’re far too cool to discuss such matters. So anyway, deep-thinking Erich, are you enjoying this site that specializes in Punk singles (late 70’s early 80’s) ?? Let’s talk about bread prices a bit, Blenny. and this record is actually really good too.